KidKATAT is always looking for new products or services that can help you and your family lead a minimal life. Our goal is to discover products that are multifunctional, space-saving, and aesthetically beautiful because we believe the things in our lives should not only serve a purpose but also beautiful. Wobbel is a perfect example of this combination of practicality and aesthetics. 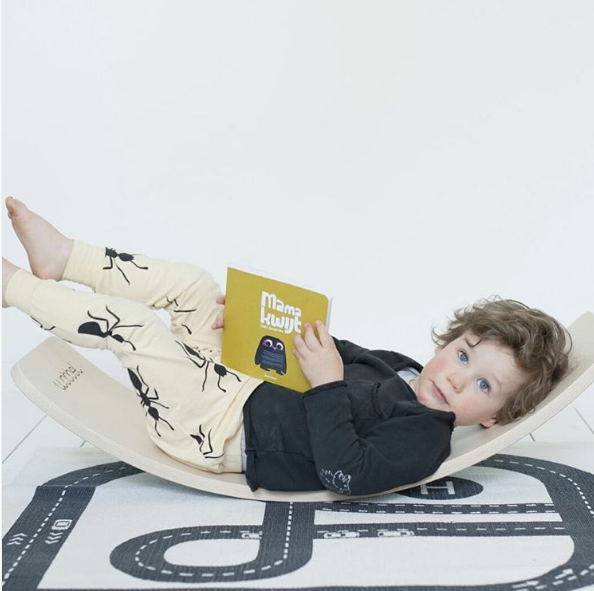 Wobbel is a balance board designed for both children and adults. Adults can use it to get in shape and children can use it to not only gain dexterity. It also can serve functions from foot stool to rocking chair to slide to table all while maintaining a simple, sleek look. We were lucky enough to speak to Wouter and Hannelore, the creative masterminds behind Wobbel, to see how they came up with such a simple but robust design. The idea of the Wobbel finds it’s origin in the Waldorf schools. 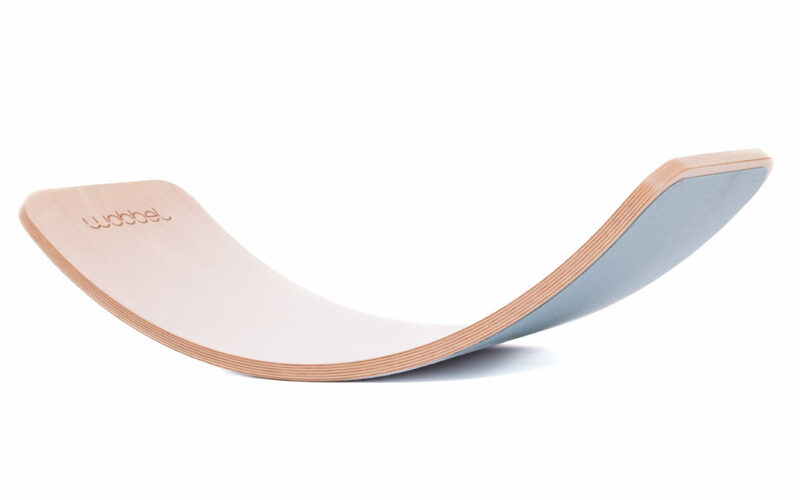 We took that old idea and redesigned the curve, finish, materials and added color and cork or felt to make it unique. We started this process in the beginning of 2015 with various prototypes. In December 2015 we went ‘live’ and started selling the Wobbel. Who is involved with the company and how did everyone meet? Hannelore Blaauw and Wouter Haine are the owners of Wobbel. We met through our children at an anthroposophical kindergarten. What were you doing for work prior to creating Wobbel? We run Wobbel next to our day jobs. Have a look at this info about that by clicking here. What was your inspiration for designing Wobbel? The Waldorf curve was the inspiration, but we thought it needed to look better and be more functional. The cork and felt addition prevent scratches and noise, but also look amazing. The natural materials feel good too. We picked the highest quality Eco-friendly materials and suppliers. The Wobbel is made by the best wood bender of Europe. They source all their wood within a small radius around the factory. They make their own veneers and layer each Wobbel is designed to prevent warping. We selected only the best quality veneer that is normally reserved for high-quality furniture. The complete process takes environmental concerns into every single step from using water based paints and glues to heating the factory with scrap wood. The EKO wool felt is from a local factory, which uses natural colors to dye the felt in beautiful vibrant colors. Did you go through a lot of design iterations when creating Wobbel? We made several prototypes ourselves, finding out in the process that laminating wood as large as this is quite a challenge, and tried them out. Our children were the best test pilots. Even after the factory made the production prototype we altered minor details to get it right. Are you surprised at how people are using Wobbel? We designed the Wobbel to stand upright and balance, but within hours we were amazed by what our children did with the Wobbel. And many Wobbels later kids and parents still surprise us with their creativity using it. It never gets old. Where can someone purchase Wobbel? The Wobbel is sold in the EU through www.wobbel.eu and from this fall a growing number of stores throughout Europe. What has been your favorite part of working with Wobbel? Seeing so many happy faces. We get a lot of pictures from parents who are absolutely thrilled about what happens when a Wobbel enters their family. Apart from the joy it gives to so many, the Wobbel created possibilities to combine what we learned in several different jobs and use those skills in a very positive way. What is the future of the company? How do you see Wobbel growing in the next 5 years? We have a lot of new ideas ready for the future. One in the near future is in the development stage. We are determined to create movement in the class room and the office. People are sitting too much and that’s a health risk. We innovate ideas were balance, movement and fun are combined to spark creativity and cognitive thinking. More on that in the future. For more information about Wobbel, just click here!